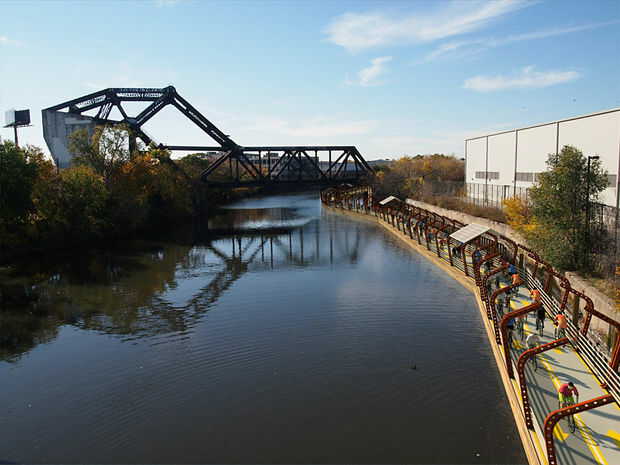 IRVING PARK — The push is on to create a continuous bike trail along the Chicago River, but one of the biggest obstacles to developing such a path is the lack of available land along various stretches of the waterway. Other cities — most notably Portland and Philadelphia — have solved similar problems by building floating trails. What would this look like in Chicago? Entrepreneur James Chuck of the company Second Shore is pitching an option he's dubbed RiverRide. Picture plug-and-play, steel-reinforced concrete pontoon segments that could be strung together — and taken apart and reconfigured — in much the same way as toy railroad tracks. Chuck said solar panels would power basic features such as lights, as well as bells and whistles that sound like something straight out of science fiction, including a precipitation-activated awning — all of which would make the trail usable 24/7, he said. 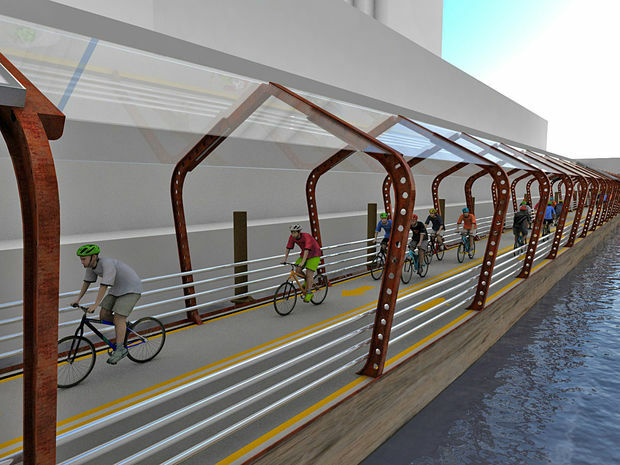 By completely separating bikes from cars on a riverfront trail, "there's an opportunity to leverage the river for modern transportation," Chuck said, as he presented an overview of the RiverRide concept at a recent meeting of the 33rd Ward Transportation Action Committee. Developed by Marinetek, a company that specializes in marinas and breakwaters, each of the floating pontoon segments would measure 82 feet long and 6-12 feet wide, Chuck said. They could be manufactured in Chicago, floated into place and secured with pilings, he said. 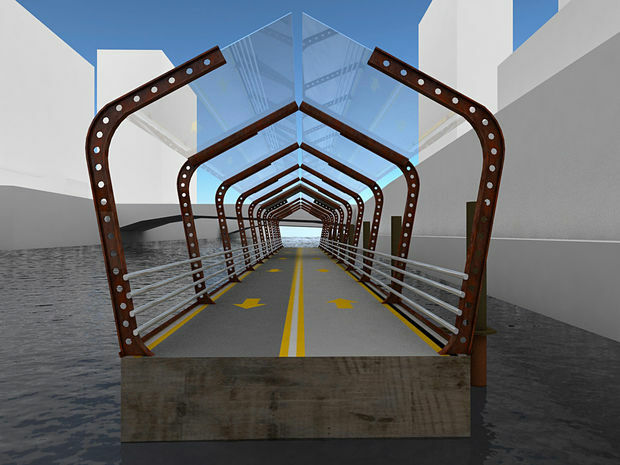 The intent is not to build a 27-mile floating trail but rather to use pontoon segments to connect parks and pathways on the river's north and south branches, Chuck said. "The goal is to enhance what's there," he said. 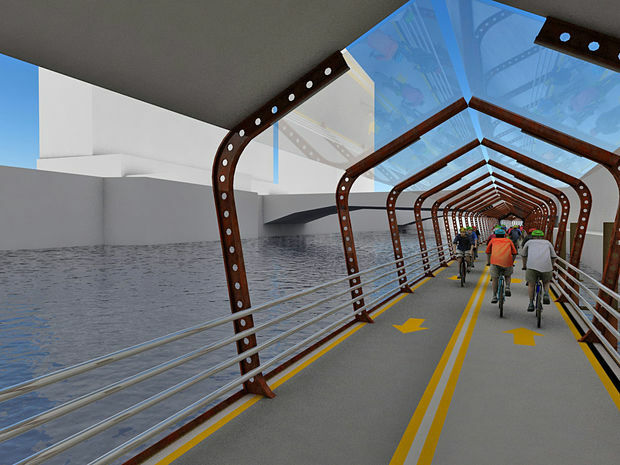 He estimated a cost of $5 million to $10 million per mile of floating trail, which could be funded with public dollars or private investment. Some members of the Transportation Action Committee questioned the feasibility of certain elements of Chuck's proposal, including the awning and the segments' narrow width. Chuck conceded he's still working to gain support for RiverRide pilot segments that, if approved, could be installed by summer 2018. "It's really an important time to start connecting the city, not dividing it," he said. The infrastructure, Chuck said, is designed to be adaptable, particularly should some yet-to-be-invented technology render the segments or the need for a riverfront trail obsolete. "It's a temporary yet solid structure," he said. "Who knows what the city will look like in 50 years?" A cross section of a trail segment, which would be 82-feet long and 6-12-feet wide. Solar panels would power lights to keep the trail bright at night. Trail segments can be added or removed as necessary.